IT is the ultimate dream of any football player to score the winner in a cup final but to do it in an Old Firm game on the 100th anniversary of the tournament takes some beating. Tom Forsyth is the man who lived that dream, famously scuffing the ball into the net from six inches with his studs to clinch victory in one of the greatest Hampden showpieces. Forsyth went on to become a terrific central defender for Rangers and Scotland but in these days he was a tough tackling midfielder who had joined the club from Motherwell less than a year earlier. He was certainly not known for his goals. Indeed, in a 10-year Rangers career he only scored six. 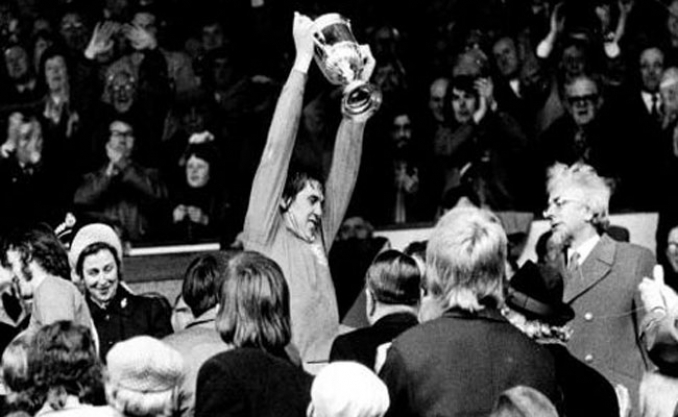 However, as someone once said, it’s quality not quantity and Forsyth’s match-winner in 1973 in front of 122,714 fans is one of the most famous cup final clinchers of all time. Rangers were drawing 2-2 with their Glasgow rivals when Derek Johnstone’s header hit the post, trickled along the goal line, hit the other post and fell nicely for Tom to bundle the ball home from a couple of inches with his studs! The tough tackling defender, or “Jaws”, as he was known, recalls that great day in front of a bumper crowd at Hampden. Tom said: “To play in your first Scottish Cup Final and score the winning goal was just a dream come true. As a boy you dream about these things and it was unbelievable really. “I just followed it in, but I honestly thought Derek’s header was going in. They all say I nearly missed it but I tapped it in and they can’t take it away from me. There was certainly a bite to his tackling and his no-nonsense style earned him a nick-name from a massive box office movie of the time. Tom said: “A reporter, Allan Herron, made up the name Jaws for me. I didn’t really like it but it seemed to stick. Of course, it was preventing goals that was his forte and he formed a terrific partnership in central defence with Colin Jackson as Rangers stormed to the Treble twice in three seasons under Jock Wallace in 1976 and 1978. He said: “I struck up a great partnership with Colin at the back. We covered for each other really well and we got on well off the park also. “When you are friends away from football it makes it easier when you’re playing together as well. It got to the stage where we had an instinctive partnership. I knew when he was going to attack the ball and when he was going to hang back and let me go forward. Perhaps Forsyth’s most famous tackle was at Hampden Park on May 15, 1976 when the curtain came down on an incredible campaign. Rangers had swept the boards. Forsyth marked Kenny Dalglish out of the game as Rangers beat Celtic 1-0 in the League Cup Final and the 24 goals conceded – 18 better than Celtic – en route to the inaugural Premier Division title was indicative of Forsyth’s influence at the back. The Scottish Cup completed the Treble – the first since 1964 – when Hearts were comfortably defeated 3-1 but Forsyth’s season was far from finished. He and Jackson were the backline for Scotland in the Home internationals and both Wales and Northern Ireland were defeated, 3-1 and 3-0 respectively, setting up a finale with England, who had humiliated the Scots 5-1 the previous year at Wembley. Southampton’s Mick Channon was the main danger and he had put England one up but a header from Don Masson and then a miss-hit from Dalglish that famously trickled though Ray Clemence’s legs gave the Scots the lead. Suddenly Channon seemed to be in the clear and an equaliser looked inevitable but Forsyth saved the day with a magnificently timed tackle. Forsyth had captained Scotland earlier that season when they beat Switzerland 1-0 in a friendly and he was also in the side that famously won 2-1 at Wembley in 1977 when the Tartan Army took over the home of English football, ripped down the goal frames and most of the turf! Tom recalled: “That was a fantastic occasion. I’ve never experienced anything like that in my life. Before the game the team bus could hardly get down to Wembley Way as there were so many Scotland supporters there. Forsyth was an integral part of the Scotland team during this period and he played in the famous 2-0 win over Wales at Anfield in 1977 which sent the national team to the World Cup Finals in Argentina the following summer. It was an ill-fated campaign as all Scotland fans remember. Forsyth appeared in all three games and his final match for Scotland was the 3-2 victory over Holland in Mendoza, forever famous for Archie Gemmill’s wonderful solo goal. He had arrived in Argentina on the back of yet another clean sweep of the domestic honours with Rangers. The Light Blues beat Celtic 2-1 after extra time in the League Cup Final but it was Aberdeen who were their closest rivals in the Championship. Indeed Rangers had to win their final match against Motherwell to edge the Dons by two points. They defeated the Pittodrie men 2-1 in the Scottish Cup Final on May 6 to claim the Treble again. However, Jock Wallace sensationally resigned as manager in a row over money and John Greig was elevated from the team to take over. Sadly, injuries began to strike the powerhouse defender which put him out of action for long spells in each of the next three seasons. It was maybe no coincidence that Rangers struggled to emulate the success of the previous years. His final honour came in the replayed 1981 Scottish Cup Final when Rangers beat Dundee United 4-1 and he announced his retirement on medical grounds on March 13 the following year. He dabbled in management with Dunfermline but with no success. However, in 1985 he became close friend and former team mate Tommy McLean’s assistant at Motherwell and the two of them were highly successful, most notably winning the Scottish Cup in 1991. He had begun his career at Fir Park, earning his move to Ibrox in October 1972, and he currently works for Rangers on match days in their hospitality suites. He said: “I always wanted to play for a top club and when I got the chance to play for Rangers it was a fantastic moment. “People watching games probably wonder what it’s like, but words can’t describe it.